For the past five years, somebody had been leaving fairy houses along the Rahway Trail in the South Mountain Reservation in Millburn, New Jersey. 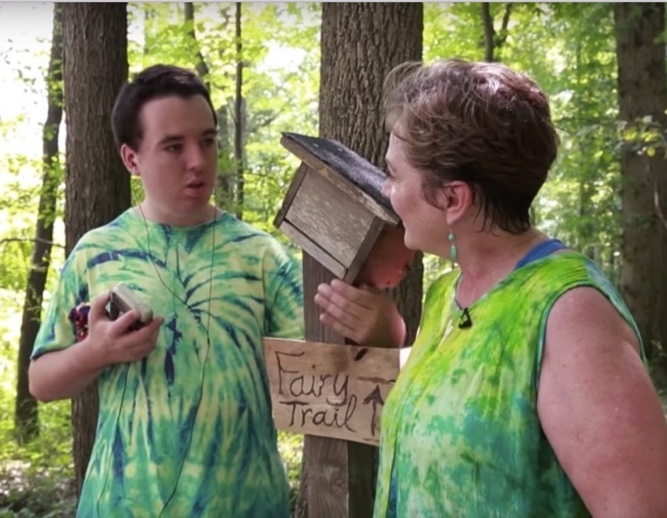 Until recently, special-education teacher Therese Ojibway relished her anonymity as the fairy house builder, along with her 25-year-old son Colin, who has autism. This past July, the New York Times first revealed her identity, and various news outlets spread her wonderful story. Therese first started bringing Colin to the Reservation when he was three. The woods were a respite for them both; giving her a place to retreat to and him a place where he had boundless freedom. That was 22 years ago. Over the years, they’ve left 20-30 of the fairy houses. The presence of the fairies has inspired many others, and families and Girl Scout groups began visiting and leaving their own fairy dwellings. Because the Reservation is part of a 2,110-acre nature reserve looked after by a Conservancy, there have had to be some rules put into place. Mainly, that anything left for the fairies has to be 100% natural–no plastic furniture, figurines, etc. Instead, they should follow both Therese and the Conservancy’s guidelines, which is that they are all-natural and made out of things like twigs and acorns and moss. They need to exist in harmony with nature, and blend into their surroundings. During the day, Therese is a teacher for the Douglass Developmental Disabilities Center at Rutgers University. She drives around New Jersey, visiting children who need early intervention for developmental disabilities. In the evening, about once a week when other people aren’t usually using the trail, she and Colin visit the houses to make repairs as needed. Therese tried to preserve her anonymity as part of the “fairy magic” with which so many children were enchanted. When visitors left notes for the fairies, she would do her best to answer them. Although people now know her identity, she and Colin still continue their weekly visits. For more information on this trail, visit here and watch the video from Upworthy below. 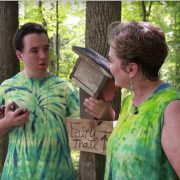 If you’re looking for a fairy trail nearer to you, we found other in the U.S., England, and Ireland with simple searches on YouTube and Google.